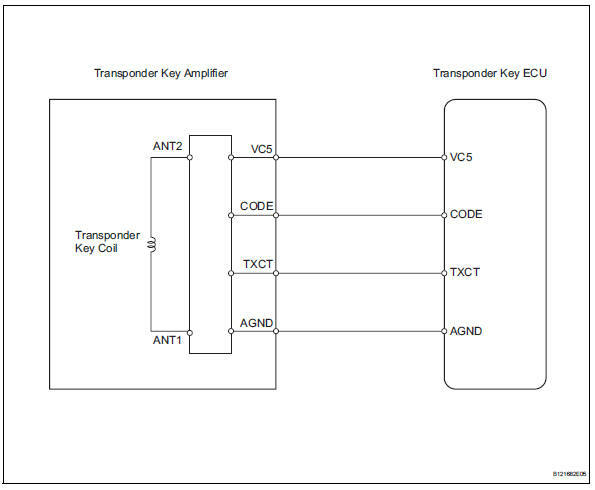 When a key is inserted into the ignition key cylinder but no communication occurs between the key and transponder key ecu, dtc b2796 is output. When a key is inserted into the ignition key cylinder but a communication error occurs between the key and transponder key ecu, dtc b2798 is output. Turn the ignition switch on with a key that cannot start the engine. On the intelligent tester, enter the following menus: diagnosis / obd/mobd / immobiliser / data list / immobiliser. Read the result. Ok: unset (key is in ignition key cylinder) appears on the screen. Check whether the engine starts with the vehicle's other keys. 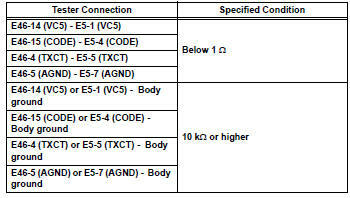 On the intelligent tester, enter the following menus: diagnosis / obd/mobd / immobiliser / data list / antenna coil. Read the result. Ok: normal (transponder key coil is normal) appears on the screen. Disconnect the e46 ecu connector. Disconnect the e5 amplifier connector. 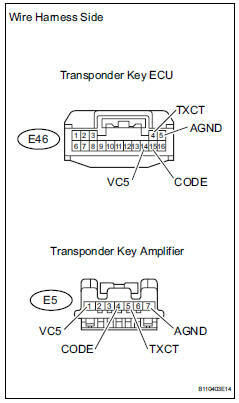 Temporarily replace the transponder key amplifier with a new or normally functioning one..